Setting up the nursery a few months before and getting my bag ready to take to the hospital made me feel like I was preparing for her arrival. What never occurred to me while reading articles and making lists was to brace myself for the huge waves of emotions I was about to experience. Enya was on when my little girl came into the world. (Part of birth plan was to make the environment as peaceful as possible.) I am a very auditory-oriented person, so I wanted to have the same music playing in her room to soothe her at night. The first few weeks are a foggy swirl of hormones, but I remember one evening going into her room when she began to fuss. I changed her tiny newborn diaper under the soft glow of the night light. It was time for her to eat, so I prepared a bottle (she never latched on, much to my dismay), played her birth CD, and sat down in the glider rocker. When “Shepherd Moons” came on, something happened to me. I looked down at her tiny hands and face, put my lips to her forehead, got a whiff of that New Baby smell and I lost it. My heart began to pound with emotion. I felt a rush that poured from my chest into my extremities and I began to shake as tears rolled down my cheeks and landed on hers. I tried not to give into my sobs and chocked by my heaves, lest I disturb her. But it was at that time that I fully experienced the power of motherhood for the first time. Alone, in the middle of the night, just her and me. And Enya. That night, I drank in every moment. I remember kissing her that night as I rocked her, promising that I would always be there for her. Since then, the world has taken on new meaning for me. I put my own desires aside in favor of her needs. I don’t take chances like I used to, since it’s not just me who’d pay the price for my stupidity. I try to set an example of how to live a life with integrity. 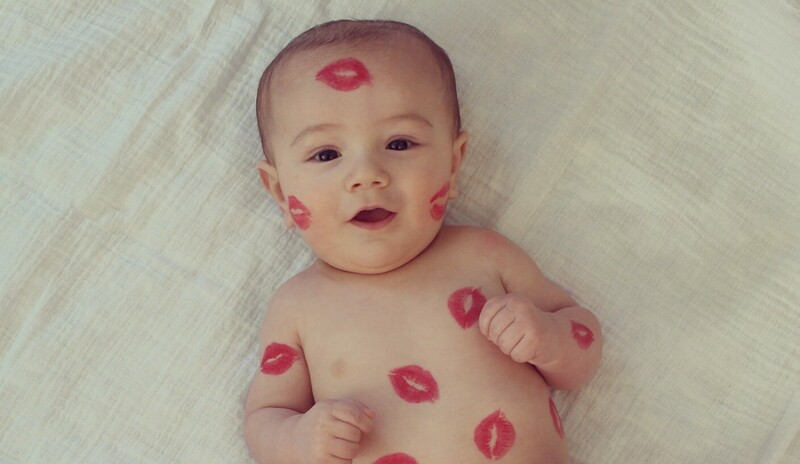 And I’ve given out a lot of kisses. A few months after that magical night, I realized that I am a very affectionate mom. I had been home on FMLA and was getting set to go back to teaching. I was spending a lot of time with my daughter, drinking in those last few days before have to go into school. There were marathon sessions of rocking, cuddles and kisses. I bet I’ve kissed you a million times by now, I thought to myself. I knew that I was exaggerating, but it got me wondering: what if I wanted to literally kiss my child a million times? How could I make that happen? I was floored! When I was a kid in elementary school, I remember how teachers tried to conceptualize the concept of one million. They’d say bizarre things like, “It would take over three weeks just to count to one million!” Or, “One million cheeseburgers stacked end-to-end would reach to the moon.” Well, now I had a meaningful context: kiss your child 153 times every day, and you will have kissed him/her over one million times! Granted, you have to start the day they are born and carry on until they are 18, but don’t you think that’s a noble pursuit? Over the course of several years, I crafted a poem that put my thoughts into verse and I finally got a publisher to believe in the message. The book “One Million Kisses” is scheduled to come out in April, 2016. In preparation for its arrival, I created 153Promise.com so people know where to come to purchase the book and learn more about my mission. It is my hope to inspire parents to make the commitment — the PROMISE — to let their children know that they are loved, everyday. Life comes with no guarantees, so each day is a gift to treasure. Making the 153 Promise means to do everything with good intentions when it comes to raising your children, grandchildren, supporting your community, or even loving the planet. How often have you heard people say, “If I’ve told you once, I’ve told you a million times,” or “OMG- I’ve heard that song come on the radio, for like, a million times this week,” or “I looooove that movie; I must have see it a million times!” It’s really easy to throw around the concept of love or a million. The 153 Promise creates a mindfulness about showing true affection on a daily basis. Please join me in making the 153 Promise.